Hair accessories can provide an edgy or sophisticated change when in a habit of repeating similar hairstyles. As well as adding detail and elegance to an incomplete outfit hair accessories can be a simplistic solution to a bad hair day! It is essential to have a variation of different hair accessories that could either add a feminine touch to a simple outfit or provide additional glamour to an LBD. Bobby pins can be a saving grace to hair that refuses to co-operate leaving the individual a definite victim of a ‘bad hair day’. Simply purchase a packet of bobby pins available at the majority of local drugstores that matches the hair colour, and slide into place to prevent stubborn hair from sticking out. This hair accessory is especially useful for those with fringes who wish to remove it from their face as bobby pins can be used to pin the fringe back. If seeking a more vintage style the pins can also be used to push the hair up slightly creating a more volumised, bouffant look. To give a 50s twist pearl hair accessories are a definite must-have for all vintage lovers. Again, pearl related hair accessories come in different forms such as clips, headbands or fascinators. These items are multi-purpose as they can be used either throughout the day or to add sophistication to a more formal, going-out look. Floral designs can give an element of femininity and elegance to an otherwise plain looking up-do. These vintage style flowers can be found in various forms including headbands, clips and bobbles. If flower hair accessories are used, colour and size should be taken into account in comparison to hair type and colour. If hair is brunette, softer colours such as pale pinks and creams are likely to stand out and be more distinctive whereas if the hair is lighter, medium to dark blues and greens are generally more complimentary. Patterned bows can be viewed as perhaps childish however they can portray a creative and unique look if styled in a correct way. Patterns include tartan, polka dots and floral designs. If the bow is not plain the rest of the outfit should not contain intense pattern in order to prevent the two elements clashing. There are two key locations to position bows, one being at the centre back of the head holding half of the hair while the rest remains down. 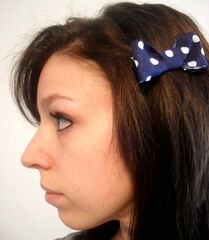 Alternatively use the bow to either support a fringe or place at the left or right hand side of the hair front. Headbands were a definite craze throughout the 90’s and have recently made in back into fashion especially alongside the futuristic trends. To imitate this sleek and high fashion look straighten the hair and select a thin metallic headband and push into place. If a more feminine look is desired a thicker, patterned headband can be used to soften an outfit or add a vintage twist. In addition to looking fabulous headbands can be useful in getting the hair away from the face. Note that facial type should be taken into account when selecting a headband as some can be unflattering to a larger forehead or sharper features. Some may say that practical hair accessories, such as clips and bobbles, are the only ones that are essential yet hair styles can easily become repetitive. The above items can provide that little bit of extra glamour to an outfit. The key attraction to using hair accessories to the maximum is to pick those that can be styled to suit either a daytime or night-time look. So add some creativity to an outfit by selecting one of these five fantastic hair accessories today! Written by Rebecca Hubbard, who hopes to never be deprived of her beloved hair products, which she often buys from Merritts for Hair.